The Elastic Soft Velvet Edging Strip is a thin, soft, stretchable, elastic and self-adhesive textile line material. It is used as an edging material on orthoses, external immobilization devices and rehabilitation aids. This Elastic Thread has a max resistance of 14 oz. (400g) and it is 30ft (10m) in length. It shows no signs of aging after 6 weeks of maximum stretching. This thread is ideal for most dynamic finger orthoses. This Elastic Thread has a max resistance of 21 oz. (600g) and it is 30ft (10m) in length. It shows no signs of aging after 6 weeks of maximum stretching. This thread is ideal for dynamic wrist extension orthoses or for very persistent finger contractures. This Elastic Thread has a max resistance of 7 oz. (200g) and it is 30ft (10m) in length. It shows no signs of aging after 6 weeks of maximum stretching. This thread is ideal for supporting weak muscles of the fingers. Luxofoam is a soft self-adhesive PVC foam used for padding of small surfaces. It does not detach when heated in water, and can be used for prepadded splint applications. The item shown is non perforated and had the dimensions 19.3" x 38.2" x 0.11". Luxofoam is a soft self-adhesive PVC foam used for padding of small surfaces. 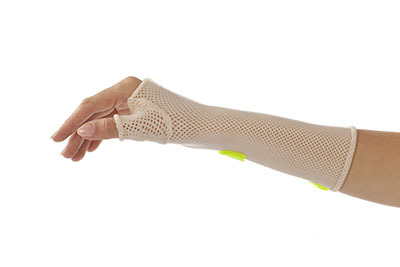 It does not detach when heated in water, and can be used for prepadded splint applications. The item shown is perforated and had the dimensions 19.3" x 38.2" x 0.11".